The SFPGA Junior Tour Alumni Association’s purpose is to connect past junior tour members and cultivate ongoing alumni support of current programs and participants. 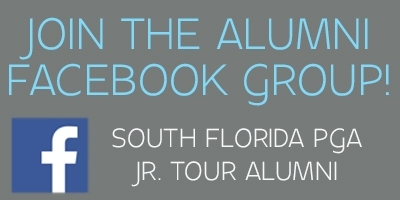 The goals of the SFPGA Junior Tour Alumni Association are to create alumni networking opportunities, hosts events, provide updates on alumni success, and provide charitable donation opportunities through the SFPGA Foundation. Joining the Alumni Association is a great way to stay involved and informed on not only SFPGA activities and programs but also in your local communities. The South Florida PGA Foundation is a not-for-profit organization founded to support the South Florida community, with a focus on junior golf, education and scholarships, and charitable gifting. The South Florida PGA Foundation falls under the direction of the South Florida PGA, a not-for-profit organization comprised of over 1,700 men and women PGA Professionals serving as the experts in business and the game of golf. Contact Caitlin Huiting at chuiting@pgahq.com to become a member of the Alumni Association. Achievements/Highlights in College (Golf & Academically): 2012 NCAA All American, Member of NCAA National Championship team in 2013 and 2014, 2011 US Amateur Participant, Assistant Coach for 2017 NCAA Women’s National Champions at Barry University, Coached 8 All Americans and 2018 National Player of the year. As a current college coach what would you recommend to players going through the recruitment process? Be proactive, reach out to coaches and send a tournament resume along with swing videos and upcoming tournament schedules. Before sending this information, I recommend that you do your research and determine if your game is comparable to those on the roster. If you are being recruited, I always recommend visiting the school. Meeting the coach face to face and seeing the school with your own eyes will help you make your decision. During the recruiting process what are certain aspects you look at most when scouting out players? There are several aspects that I look at when evaluating recruits. Obviously, tournament results play a big factor. However, once I begin recruiting a player, I look at things such as communication skills, demeanor on the course, work ethic, and other intangibles. I recruit players that are dedicated to reaching their full potential and put in the time and make sacrifices in order to reach their goals. How did playing in the SFPGA Junior Tour prepare you for the next step in your golf career? Playing the SFPGA Junior Tour greatly prepared me for the next step in my golf Career. Tournament golf is vital in the development of a junior golfer and the SFPGA Junior tour gave me the experience and knowledge necessary to become successful at the collegiate level. 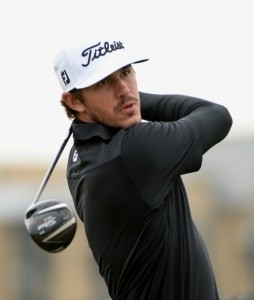 The tour offered an amazing tournament schedule on great golf courses and very strong fields. Continuously playing in these events against the best junior golfers in the area and country, gave me the confidence to compete at a high level. What/Who inspired you to play golf and why? My grandfather inspired me to play the game of golf. Throughout my childhood, my parents and I would make an annual visit see my family in Pamplona, Spain. On one of these visits, my grandfather took me out to the golf course. After watching him play the front 9, he let me hit his 7 iron. I instantly fell in love with the game and haven’t stopped playing since that day. What did you enjoy most about participating in the SFPGA Junior Events? What I most enjoyed about the SFPGA was the level of competition and the camaraderie. Most memorable moment in College (Golf related and Non-Golf Related): My most memorable moment was competing in the 2011 US Amateur. It was always a dream of mine to play in this event. If you could play a round of golf with a PGA Tour Professional and LPGA Tour Professional who would it be and why: Tiger Woods. I grew up watching Tiger dominate the sport and his performances motivated me to work even harder. Michelle Wie. She is an incredible player and also seems fun to play with, I just hope she doesn’t outdrive me. If you could have anyone caddie for you, who would it be and why? Any of the veteran PGA tour caddies. There is a lot to be learned from the veteran tour caddies, they are extremely knowledgeable and always know what to say. Kaylin Yost, an alumna of the South Florida Junior Tour, began her journey in 1992 of becoming a successful, smart, talented young woman. With difficulties from birth and into her childhood, she had to overcome many obstacles doing so with a positive attitude and outlook. At age two, her parents found out she was hearing impaired in both ears and has been wearing hearing aids ever since. Kaylin didn’t look at this as being a disability but rather as a gift. Yost’s journey through the South Florida PGA Junior Tour helped her gain valuable tournament experience preparing her for the next level. From the South Florida PGA Junior Tour she went on to play collegiate golf at Campbell University. During her college golf career, she received the Big South Player of the Year Award in 2012 and 2014, in addition to winning a total of four collegiate events. Graduating in May of 2014, Kaylin decided to turn professional in July. After playing a series of events through the Sun Coast, Symetra Tour, LPGA Monday Qualifiers, and local professional events, Yost decided in September of 2015 to take a break after not reaching her big break. In 2015, Kaylin went on to work for a company called JetSmarter, a partner of the South Florida PGA Foundation. During her time with them she realized that golf was her true passion in life. This March, Yost went on to compete in the Bank of Hope Monday LPGA Qualifier where she shot a 5-under par, 66, at Longbow Country Club earning one of two spots into the LPGA Bank of Founders Cup Event. Upon qualifying for the event Kaylin played well enough to make the cut, finishing the weekend at even par, 74th place! As a South Florida PGA Junior Tour Alumni, Kaylin Yost has traveled through the journey of life with one goal in mind, and now she has reached her big moment doing what she loves most, golf at the highest level. On behalf of the South Florida PGA Junior Tour Alumni Association, we wish Kaylin nothing but the best moving forward as we watch her journey continue into future LPGA events. Spencer Stillman’s love of golf and passion for the game is unlike any other junior tour player. 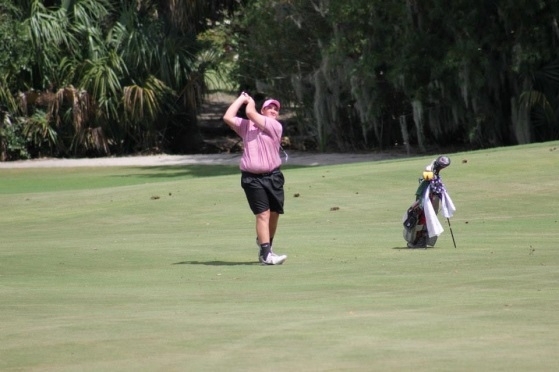 Spencer was a member of the South Florida PGA junior tour for the 2013-2014 seasons, during this time he participated in 23 tournaments and had a scoring average of 79.33. Spencer was always the one to have a smile on his face, thanking members and the PGA Professional staff for hosting the event at their course. If his tee time was at 8:00 AM, he was there at 6:30 AM hitting practice putts and saying good morning to everyone he saw. At the age of fifteen, Spencer started working at the Country Club of Coral Springs where he knew he wanted to get into the golf business. His mentor Corey Henry, PGA who currently serves as the Head Professional at Country Club of Coral Springs encouraged Stillman to get into the golf business by entering into the PGA Golf Management University Program at Florida Gulf Coast University, which happened to be Henry’s alma mater. Stillman is now entering his sophomore year at FCGU and just returned from his internship at Penn Oaks Golf Club in Westchester, Penn. Spencer credits his mother, Mindy Stillman as his biggest supporter and inspiration. Spencer says that when he was younger he played hockey and his mother would drive, fly, and spare no expense for her son’s happiness. When Spencer decided to take up golf, his mother supported him and continued to do anything to help Spencer reach his goals. 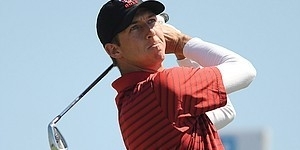 In 2014, Spencer played in the Future Masters Tournament in Alabama, where he says he and his mom jumped in the car and drove 10 hours to their destination for him to play golf. Spencer shares with us that he added Accounting as a double major and hopes to buy his mom a new car after he graduates as a repayment for the miles she has gone to help him become successful. 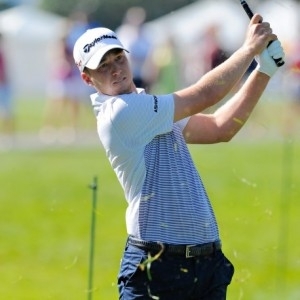 Being alumni of the junior tour, Spencer has one piece of advice to give the current members, “Have fun and always be friendly.” Stillman says that when he played on tour he would be the one to be optimistic during the round, but admitting that it is hard to keep your spirits high after making a double bogey, he adds, “I would always enjoy the day and hopefully play well.” As a well-known smiling face around the junior tour, Spencer expresses that being friendly is important because you never know who you will meet on any given day and who you will still be friends down the road. 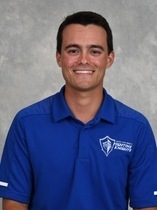 We here at the South Florida PGA wish Spencer all the best in his future endeavors to becoming a PGA member and much success at Florida Gulf Coast University. Ashley Burke, of Boynton Beach, is a well-known alumnus of the South Florida PGA Junior Tour. In her Junior Tour career with the SFPGA, Burke logged an impressive 35 top-10 finishes, which included four first place finishes. While playing in the SFPGA Junior Events, Burke also played for the American Heritage Women’s Golf Team in Delray Beach. Burke earned first-team all-county honors as a freshman, junior, and senior at American Heritage, while also collecting varsity letter’s all four years. 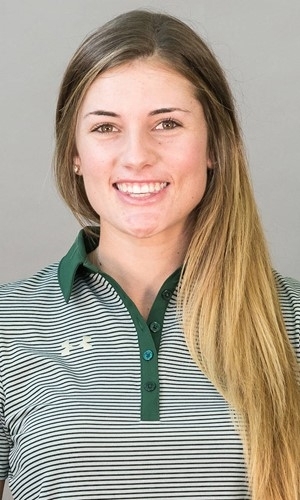 Her success would not stop there, as her father, Jerry and mother, Kerri knew she would start a new chapter playing college golf on a scholarship at the University of South Florida. In her freshman year at USF, Ashley showed that she was there to play and started her career with 4 top-10 finishes, while competing in a full season (11 tournaments) for the Bulls. Recording 41 rounds for the Bulls, Burke had a 74.4 scoring average that included six rounds shooting par or better, not to mention 4 rounds in the 60’s. Burke got her first college win at the Florida Challenge, which was played at the very difficult Black Diamond Ranch Golf Club in Lecanto, FL. Not only did Burke get her first win but she continued to impress by placing second in the Old Waverly Bulldog Invitational, tying for tenth in the American Athletic Conference Tournament, and qualifying for the NCAA Regional Tournament as an individual. To top it all off, Burke was named an All-Conference Honoree for the ACC Conference. We wish Ashley all the best in her next upcoming seasons at the University of South Florida and much success in any future plans. Chelsea Mokary, of Lake Worth, has one impressive resume. 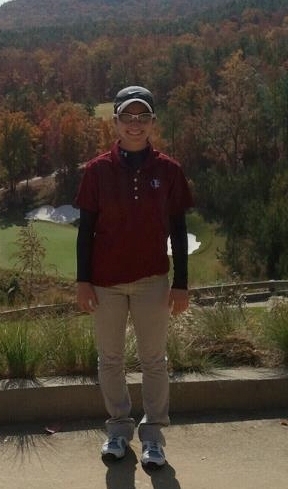 Starting her Junior Tour career with the South Florida Section Junior Tour, Mokary played in seven tournaments, while also competing in High School matches at Park Vista in Boynton Beach, Florida. Mokary was a four-year varsity player and in 2009 she led her team to their first ever State Tournament appearance. After graduating from Park Vista, Mokary went from being a Cobra to a Seminole, enrolling at Florida State University. With golf as her primary focus she entered into the PGA Professional Golf Management University Program. Graduating with her Bachelor’s Degree along with a 3.4 GPA from Florida State University, Mokary had her sights set on working at some of the best golf clubs in the country. During her studies, Mokary did three internships at Indian Spring Country Club, Philadelphia Country Club, and Kiawah Island Resort/Ocean Course. She is now a PGA Member serving as an Assistant Golf Professional at East Hampton Golf Club in Long Island, NY in the summer months. “My favorite part of working at East Hampton is that every day is different”, says Mokary. Her main tasks on a day to day basis include, buying merchandise for the Pro Shop, displaying the merchandise, and giving lessons to junior golfers. “I really enjoy being able to break up my day”, adds Chelsea. Mokary’s future aspirations in the business are more on the teaching side, where one day she hopes to become a head teaching professional. We wish Chelsea all the best in her future endeavors and much success in any future plans.